Lauren Brill plays the trombone. Samantha McCarthy is an Emerson student who also plays in the Boston College symphonic band. Lauren Bennett participated in the band last year. 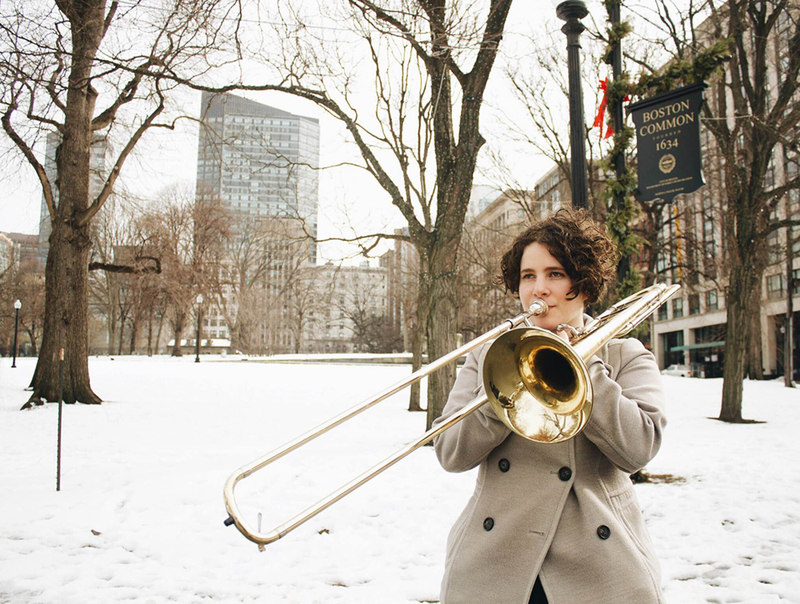 Lauren Brill was in search of a noise-tolerant safe haven upon discovering practicing trombone in a dorm room was far from fulfilling. She found her answer in Boston College’s symphonic band. Brill and her roommate Shannon McCarthy, both sophomore visual and media arts majors, spend two hours a week practicing with BC’s director David Healey. His symphonic and marching bands are open to Boston College’s surrounding community and universities in their Partner School Program, including Emerson. Everyone who participates must pay $150 for registration, uniforms, and activities, according to Healey. Emerson, as a member of BC’s Partner School Program, has a slightly reduced fee and currently has five students in the symphonic band of 80 and six in the marching band of 180, according to Healey. McCarthy, an alto sax player, said they first heard about the opportunity through a post on an Emerson facebook page freshman year. Theysaid they joined Healey’s symphonic band, made up solely of percussion, brass, and woodwinds in hopes of continuing their high school love of music, despite a lack of available on campus programs. Brill said she saw McCarthy enjoying the concert group and decided to become a part of it herself. They both said the only thing they dislike is the hour-long MBTA round trip ride to and from rehearsals. Lauren Bennett, a sophomore journalism major, quit the symphonic band because of the lengthy trips. She said with her other commitments, she didn’t have time to make the trek to Boston College. Although none of the three are planning on pursuing a career in music, Bennett said playing with a variety of people is beneficial to them as musicians. Because the band is open to BC alumni, more experienced members can join too, including some who graduated decades ago. The symphonic band puts on four concerts a year, with one taking place in the summer. The level of difficulty varies by piece, but they all challenge the band’s members, McCarthy said. Some previous works performed include “The American Dream" from Night Visions and “Lux Aurumque” by Eric Whitacre, Bennett’s favorite, she said. The trio said they continue to recommend other Emerson students join, despite the challenges that come with it. Samantha McCarthy uses they pronouns.